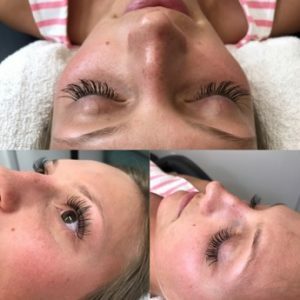 Semi- permanent high fashion synthetic fiber or all natural 100% mink lashes are meticulously applied to each individual natural lash creating volume and length. For those who want a very natural look. This set combines different lengths, curvatures, and thickness to create lashes that appear longer and more voluminous. I enhance 75% to 85% of your natural lashes. The Level 2 Full Set combines various lengths, curvatures and thickness to create an extra full and more defined look. The results are a darker lash line and a perfect mascara look. This is perfect for the girl who wants a full lash look. I attach extensions to 90% to 95% of your natural lashes, giving you the fullest look safely possible for your eyes. The all natural solution for removing unwanted hair. The basic method of sugaring hair removal has been in use since 1900 BC! Exceptional for all skin types, hair textures and skin sensitivities. Using only 100% natural & biodegradable ingredients, Sugaring not only exfoliates the dead skin cells, it removes hair in it’s natural direction eliminating breakage and in-grown hairs making it possible to remove the hair as short as 1/16 inch. Enjoy a refreshing shampoo with a designer cut and style, suited just for you. I will take the time to get to know you and your hair and educate you on the products and tools you need to get the look. Whether you need the clean-cut professional look, a polished pompadour, or a roughed-up style, I will take the time to get to know you and your hair to achieve the best look for you. From grey coverage to an all over change, i can choose from hundreds of color options to formulate the perfect color for you, your skin tone, and your lifestyle. Whether its a racy red, brilliant brunette, or bombshell blonde, I will find the best fit for you. Get the latest trend in hair coloring where the roots are blended from a darker to a lighter color towards the ends. The sun-kissed look is considered a double process technique where I will lighten your hair to the desired result and glaze for an intense shine. Add some brilliance to your look with this high-impact color technique involving lightening and/or darkening from top to bottom. Corrective color is the process required if you are wanting to completely change your hair’s color. 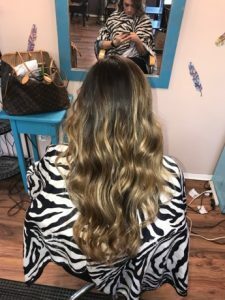 Whether you’re wanting to go from a dark brown to all over blonde or wanting to change the over-all look of your hair, corrective color is for you. I will make sure to keep the integrity and health of your hair an absolute priority. From weddings to prom, let me use my creativity and skill to create the perfect updo for you. Go Blonder. Push the envelope further without compromising the integrity of hair. Olaplex dramatically reduces breakage and makes color last longer. Olaplex restores the integrity of your hair.